Tonight... PDI Competition Open and "Night"
It's the final round of our PDI league competitions for this season! Just 3 points separate our top two authors in the Advanced Class - Steve Bailey and Anthony Highet. The Intermediate league is being dominated by George Purchase, who has scored a whopping 14 points more than his closest competitor Rod Lacey. But with all but 7 of our PDI authors having a chance to scoop enough points in the final round to make a difference in the league, it's all to play for! 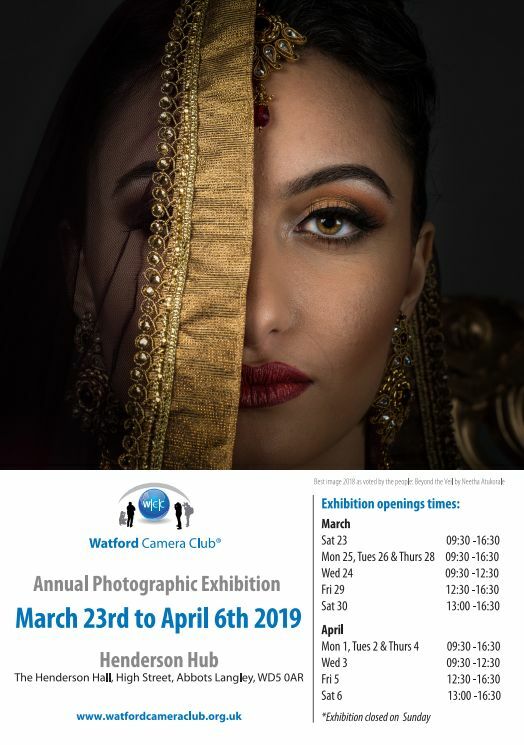 This exhibition organised by Imagez and is open to any member of a camera club affiliated to the Chilterns Association of Camera Clubs (CACC). The selected prints will be displayed in the exhibition at Queens Park Art Centre in Aylesbury from 6th to 17th May 2019. The exhibition will also be available online on their website. Every entrant is guaranteed to have at least one print selected (maximum 3 prints). You can enter online via their website and then give your prints to George who will deliver them to the competition organiser. Join members from camera clubs around our federation as we compete in the CACC Championships. There will be three competitions on the day - PDI Championship, Print Championship, and the Chilterns Hundred Members Exhibition. These are a great opportunity to see images from a wide range of clubs. More details about the day are on the CACC website. CCC judge Steven Galvin will be returning to explain why "I shoot animals (and sometimes I chop their heads off!)". Print Competition: Open & "Shape"
This month we'll be taking a look at Layers and masking so bring along your laptops for an evening of Photoshop skills. SB Cup for studio portraits taken at a club session. The Parish Council has the hall so we need your suggestions for a club activity that evening. From next season, Croxley is proud to be taking part in the North West London Federation Inter-Club Competition alongside many of our neighbouring clubs. The competition will take place throughout the season, with Croxley hosting a home match in December. Clubs compete with both Prints and PDIs in the hope of reaching the finals later in the year. Recently there's been a bit of chatter about how our top-scoring images are used in this newsletter and online, so the committee wants to take this opportunity to clarify how the Photo Entry preferences are used. It's important for the running of the club that we are able to credit the author of the images, publish details in our newsletter and produce score sheets and league tables for competitions. The most reliable way for us to credit the author is to automatically generate copies of the images from Photo Entry which have the title and author name watermarked onto the picture. We already use these versions in this newsletter and from the next competition we intend to display the same versions online. This is the same as other clubs display their members' images. If you don't want your image to feature on the website or in the newsletter then please select Do Not Publish. What If I Don't Want My Name Published?